When we looked at hardware, we mentioned the Central Processing Unit (CPU), often called processor for short. All computers contain a processor, be it a mobile phone, tablet, laptop, desktop or server. A CPU has legs on the bottom that connect it to the motherboard. On top a heatsink and fan is fitted to remove heat from the processor. 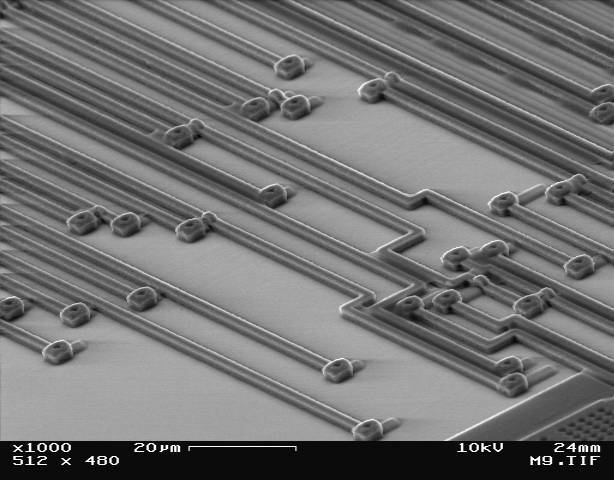 In the picture above each transistor is spaced just 20 nanometres apart. That’s really small, so how do processor manufacturers make them? Watch this part of the Royal Institution Christmas Lectures 2009 which explains just how fast processors can be (teachers – 6m40s to 10m23s – click here). Watch this part of the video which shows how processors use switching to perform logic calculations (teachers – 12m1s to 13m29s – click here). Watch this part of the video which explains why processors performing fast switching has resulted in fast processors (teachers – 27m12s to 28m28s (then do practical) – click here). Watch this part of the video which goes through the problems of heat and why this is a barrier to processors getting even faster, along with the solutions that manufacturers have come up with (teachers – 31m13s to 35m04s – click here). Fill in this worksheet describing different processor speeds.